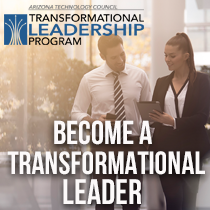 Applications are now being accepted for the next cohort of the Arizona Transformational Leadership Program that begins this September. This six-month program is designed for executives and senior leaders who are succeeding but know there must be a better way to do and be what they imagine. Participants will learn about leading self, leading others and leading the organization in five modules over a six-month period. The learning in each module builds upon the previous module and provides practical application that participants can begin using right away. The leadership program is divided into five modules, each led by different experts in the field, including Neil Stroul, founding faculty member of Georgetown’s Certificate in Leadership Coaching program; and Robin Postel, adjunct professor at NYU Robert F. Wagner Graduate School of Public Service and founder of Transformational Learning for Individuals and Organization. The rewards recognized by your leader and company will greatly exceed the investment. Please contact Margo Boster at margo.boster@impaq-solutions.com or visit AZTransformationalLeadership.com for more information or download the application today.